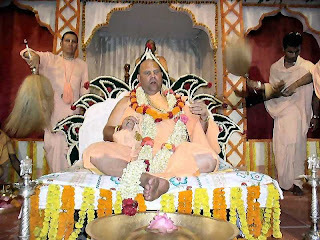 It appears that some time last night (23rd October 2008) Jayapataka Swami suffered a stroke in his sleep . When his servant tried to wake him this morning he couldn’t rise and appeared to be calling for help. He couldn’t articulate his words. On 23rd October 2008 early morning, he was found in the bed unconscious around 3.30 a.m. Devotees rushed him to the Hinduja hospital, thinking that Maharaja may had a heart attack. He was admitted in ICU. But later doctors diagnosed that it is brain haemorrhage . Doctor P.P Ashok has reviewed the case thoroughly there is a haemorrhage in the brain stem and therefore it is a critical situation. The brain stem contains all our vital centers of function like breathing, consciousness etc. Therefore a slight increase in Haemorrhage can cause a life and death situation. It was found at two places in his head there was internal bleeding. Bleeding has stoped. The place is delicate and doctors cannot do any operation. They are trying to treat by medicine. 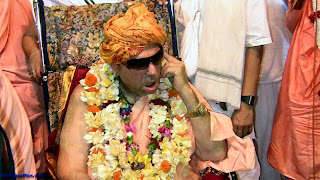 Till now Guru Maharaja is in unconscious state. 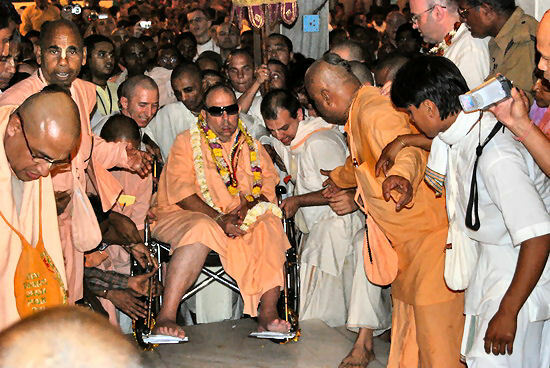 Devotees saw one time HH moving his hands and leg. Now it looks like he is sleeping peace fully. Before he was breathing heavily with a lot of sound which has stopped now. Maharaja had a stroke and brain bleeding in 2 places . One of the areas of bleeding is the root of the brain, a most sensitive area, a place where surgery cannot take place. The condition is critical, the surgeon’s opinion that Maharaja’s chance for survival slim . This afternoon the doctors did a Tracheostomy . Tracheostomy is a surgical opening in the trachea (windpipe) that forms a temporary opening to make breathing easier. They have inserted the ventilator tube into this hole instead of sending the tube through the mouth. Since Jayapataka Maharaja is unable to breathe by himself they cannot remove the ventilator. They cannot keep the tubes through the mouth for a long time and it can catch infection. Guru Maharaja also feels uncomfortable with the tubes. Therefore the panel of doctors decided to go for tracheostomy. Sivarama Swami, Radhanatha Swami, Gopala Krsna Goswami and Bhakti-vijnana Swami, Bhakti-caru Swami and Bir Krsna Goswami are with him in the hospital and the most recent report from Sivarama Swami is not good news. Different devotees have been asking us how they can help Guru Maharaja at this critical moment. One very important service that is required now is to donate for the hospital and medical expenses. 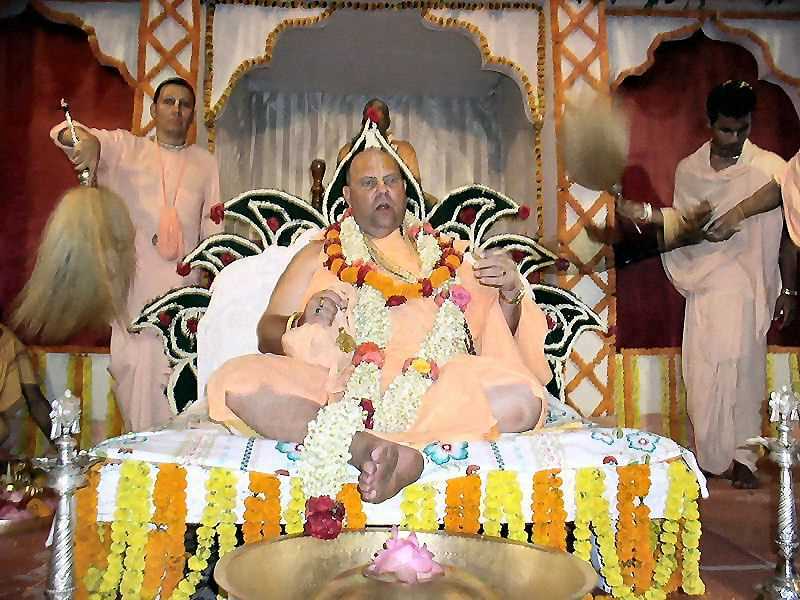 What is a brain-haemorrhage of the brain steam similar to the one Maharaj had? Answer - The term used for conditions in which an area of the brain is transiently or permanently affected by ischemia (lack of blood supply) or bleeding is cerebrovascular disease (CVD). One or more of the blood vessels in the brain may be involved in the pathological process. Intracranial haemorrhage is the pathological accumulation of blood within the cranial cavity and this may occur within the brain parenchyma (intracerebral haemorrhage) or the surrounding meningeal spaces. Haemorrhage within the meninges or the associated potential spaces are called epidural haematoma, subdural haematoma, and subarachnoid haemorrhage. Intracerebral haemorrhage (ICH) may extend into the ventricles and is then called intraventricular haemorrhage. ICH results from a wide variety of disorders and is more likely to result in death or major disability than other forms of bleed as the haemorrhage itself and the accompanying swelling may disrupt or compress adjacent brain tissue, leading to neurological dysfunction. If large parts of the brain are so displaced, there is rise in the intracranial pressure (ICP) which can cause potentially fatal brain stem herniation. Common causes for this include trauma; ruptured intracranial aneurysms (congenital weakening of blood vessels); arteriovenous malformation (an abnormal collection of blood vessels where arterial blood flows directly into draining veins); vasculitis; tumour; use of anticoagulants; bleeding disorders like haemophilia. The cause may be unknown in nearly 25% cases. A haemorrhage in the brainstem region may present with coma, posturing, loss of brainstem reflexes, and oculomotor abnormalities. It most commonly involves the pons and generally has a poor prognosis . The immediate management is largely dependent upon the cause, location, and size of the haemorrhage, as well as the clinical status of the patient. CT angiography or MR angiography permits visualisation of the blood vessels for arterial diseases like arteria-venous malformations, vasculitis, etc. Medical treatment is given when there are minimal neurological deficits or the bleed is less than 10 cc. Some of the indications for surgery are – haemorrhage more than 3 cm, presence of a structural vascular lesion, lobar haemorrhage, etc. Surgery may include craniotomy and clot evacuation under direct vision; stereotactic aspiration with thrombolytic agents or endoscopic evacuation. The above medical account of Jayapataka Swami was completely taken off the public internet. 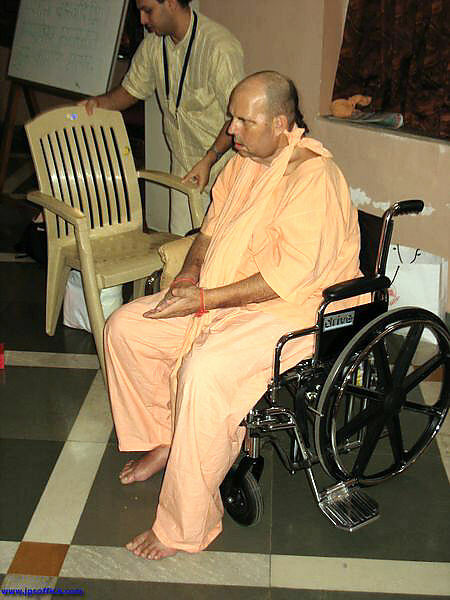 After Jayapataka recovered from his brain haemorrhage , he wasted no time to go to the Bangalore Shubharam Kalyana Temple to create disturbance for the ISKCON-Bangalore Temple . 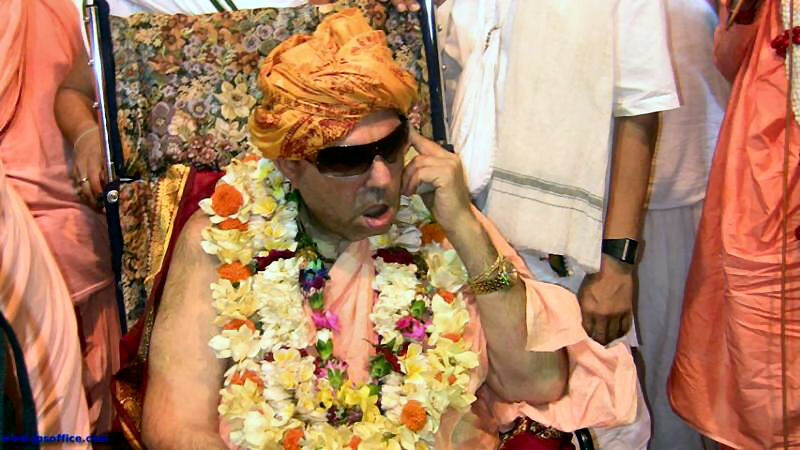 Comment : It seems that Iskcon-Mumbai is implying that Jayapatkas brain hemorrhage is related to his prior court case against ISKCON-Bangalore. So why Jayapataka is again appealing the court case, which he lost already. Doesn’t he understand Krishnas warning ? That picture (right) shows Jaya Pataka Swami cross-examination at Appellant Court in Bangalore, India . 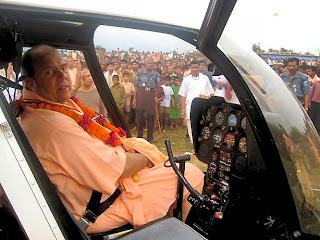 Is Jayapataka Swami going to die ? Sure, sooner or later, that is the law of material nature. 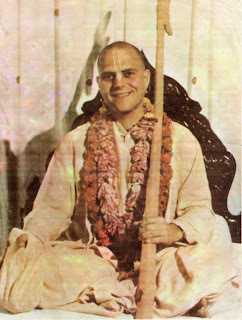 But we think that he might die sooner than later because of all of his offences to the devotees of the Bangalore temple. 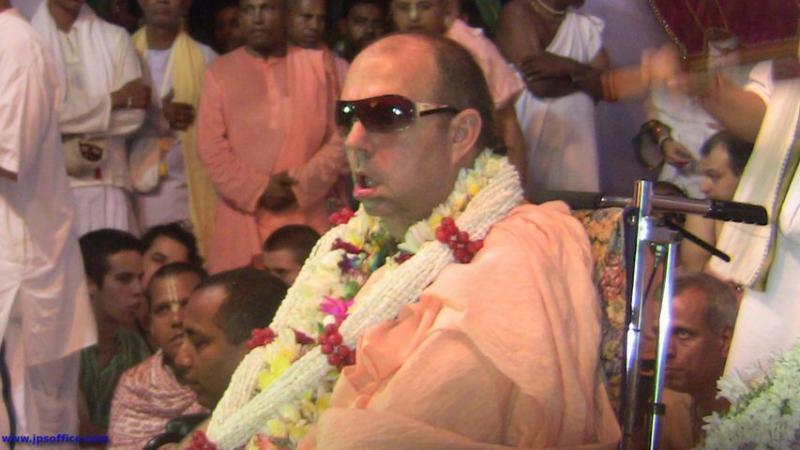 It is said, that life span will decrease by commiting offences to Krishnas devotees.